Want to know what’s in store for campers at Camp Food Fight!? We work hard to offer a summer camp that’s not only fun, but meaningful too. 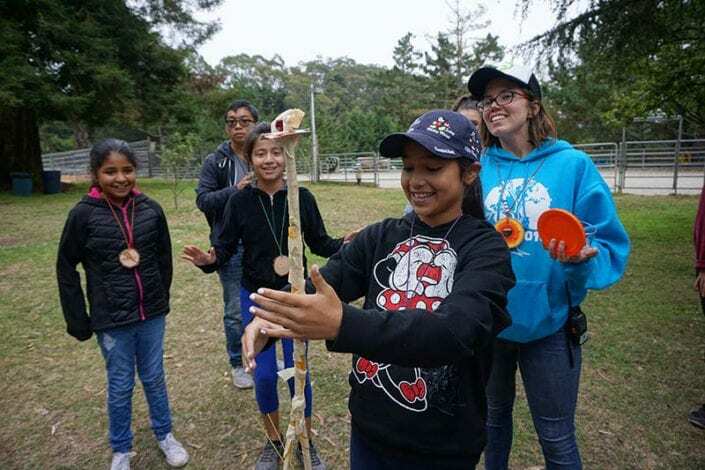 Campers experience familiar camp traditions as well as new experiences like working with a team of campers to create a solution to some of the biggest challenges in the food world today. 8:30 – Camp Begins at the flagpole! 8:45 – Theme in Focus: This is an activity based on the theme of the week. It could be a mock farmers market, an exciting camp guest, or a fruit/vegetable experiment! 9:30 – Deep Dive with Squad Leader (with snack): This will be where squads work on their business pitch. This could include making tv/radio ads, building prototypes, designing logos, and more! 12:45 – Camper’s Choice: This is a chance for campers to explore new skills like gardening, cooking, working with horses, and code breaking! 2:00 – All-Camp Challenge: Squads work together to complete challenges and to earn points for Food Fight Field Day, a camp-wide, ultra-fun camp tradition! We know how busy life is as a parent, so we also offer Extended Care before camp from 7:30-8:30 am and after camp from 4:00 – 5:30 pm.